Meditation is the journey within. 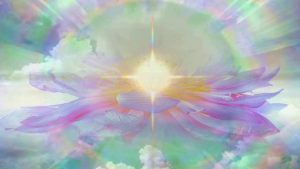 You alone hold the key to entering that realm, and you should feel free to use any meditation chants you feel is right for you. Meditating to a mantra while in meditation keeps the mind silent for the duration. If you are not at the point where you have complete mental mastery, you’ll struggle with this in the beginning as your mind keeps wandering to different topics. By repeating one singular mantra you will find that the mind will slip into a deep meditative state. This meditation state will help you absorb the teachings of the mantra deep into your subconscious mind. Furthermore, the mental repetition will also have the benefit of providing the conscious mind with a deep restful state along with increasing your capacity to concentrate. When beginning mantra meditation choosing a mantra which focuses the mind is an essential step. If you are in contact with a spiritual teacher then you may choose to have them select your mantra for you. If you’re unable to speak with a spiritual teacher, then selecting your own Sanskrit mantra should be your focus before beginning. Once a mantra is chosen you may begin the practice of mantra meditation. Sit in a cross-legged position (try easy pose), much like you would in daily mindfulness meditation. You would then bring focus to the breath (practice pranayama) and allow a full and natural breathing pattern to relax the body and mind. In the case of mantra meditation, rather than focusing on the breath, your focus will be on the mantra. Tibetan Buddhists believe that chanting the mantra, Om Mani Padme Hum out loud or silently to oneself, invokes the powerful benevolent attention and blessings of Chenrezig, the embodiment of compassion. Viewing the written form of the mantra is said to have the same effect. This mantra is commonly carved into stones and placed where people can see them. In times of great difficulty, millions of people call upon “Great Noble Tara.” In Tibetan, Goddess Green Tara is called Dolma or Do’ma. The practice of Green Tara helps to overcome anxiety and fear, but devotees also consider that she can grant wishes, eliminate the suffering of all kinds and bring prosperity and happiness. You can use this mantra to overcome all obstacles and hindrances. This is the healing mantra of Amitabha Buddha which protects you from dangers and obstacles and overcomes all hindrances to your success. This powerful mantra enhances your compassionate and loving nature bringing incredible blessings each time you chant the mantra, aloud or mentally. Aum or Om is the most important and significant word of mantra tradition. The sacred vibration produced by chanting Om mantra in the physical universe corresponds to the original vibration that first arose at the time of creation. If you chant this mantra continuously, year in and year out, it will become your habit. It will become a subtle layer around you; it will prevent you from hearing the real OM. The real OM cannot be produced by you. Shakyamuni is the historical Buddha, also known as Siddhartha Gautama. This soothing mantra is a play on his name. Muni means sage. Maha means great. So the Shakyamuni mantra reads “Om wise one, wise one, greatly wise one, wise one of the Shakyans, Hail!”. Goddess Durga is one of the most popular Goddess in Hindu religion. In Sanskrit, the word ”Durga” literally translates as the one who is unbeatable and can not be defeated hence unconquerable. Goddess Durga symbolizes the divine forces known as divine shakti that is used against the negative forces of evil and wickedness. The Goddess is compassionate and kind to her devotees who adhere to Dharma (spiritual path) and therefore the Goddess is worshiped in many regions. Using this mantra, facilitate concentration of mind. Lord Kartikeya or Murugan is one of the most worshiped and adored Gods in South India. Kartikeya is considered as an avatar of Lord Shiva. It is considered that if one worships Lord Murugan on Friday and fasts on that day all his wishes will get fulfilled. Rama is one of the many popular figures and deities in Hinduism, particularly Vaishnavism and Vaishnava religious scriptures in Southeast and South Asia. Lord Rama’s life and journey is one of perfect adherence to dharma despite harsh tests of life and time. Lord Rama is the personification of noble virtues, pure thoughts, and utter triumph. Chandra Dev, as a God, is fair and youthful in appearance. Lord Chandra is considered wise, auspicious and peaceful. The planetary deity Chandra is pleased increasing mental health and peace of mind, perfect for meditation. This pacifying mantra symbolizes the most auspicious thing that can happen to an individual – to realize the highest within yourself. This is the Ganesh Mantra associated with Lord Ganesh – the elephant-headed deity. Chanting of this Sanskrit mantra is associated with calling of the powerful healing energy of Lord Ganesh, helps in calming the person (again, perfect for meditation) and bringing overall positivity in life.